A huge thanks to all those who worked so hard and gave up their valuable time at the Chatsworth Country Fair this year. The event was a great success, with lots of interest from the public, and the quality of the build and attention to detail exceptional. I am so very proud of the Derbyshire Branch, the team spirit shown by all, and the way in which members muck in and interact. The Dry Stone Walling Association of Great Britain (DSWA) is a charitable organisation that was founded in 1968. The Derbyshire branch was established in 1982 and includes members in the neighbouring counties of Cheshire, Nottinghamshire, Leicestershire and Staffordshire. Our purpose is to advance education in the craft and heritage of dry stone walling for the public benefit. The Derbyshire branch officers are: Carl Hardman, Chair, 07768 978846, Trevor Wragg, Vice Chair, 07702 925309, Jon Earnshaw, Secretary, 07879 673450 and Alan Malia, Treasurer, 07974 508223. Click here for details of how to join the Dry Stone Walling Association. We run a comprehensive training programme of dry stone walling courses for members of the public with little or no experience to 'have a go' at dry stone walling. Weekend courses run every month from March to November. Click here for details of dry stone walling courses for beginners in 2019. For our members, we organise practice weekends to improve skill levels through evaluation by a qualified instructor. Different sites are used to gain experience on the different stone types native to Derbyshire. Click here for details of practice weekends for members in 2019. Our members regularly demonstrate the craft of walling at country shows throughout the region. 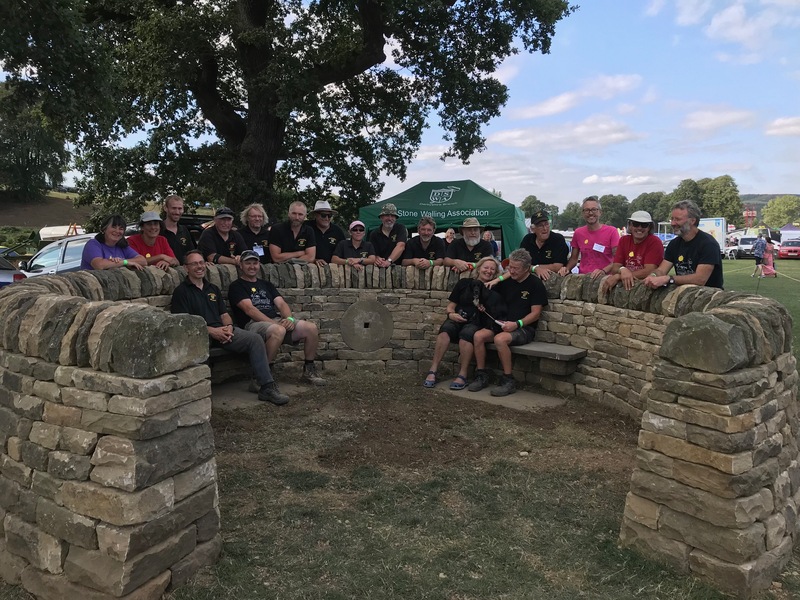 Click here for details of dry stone walling demonstrations in 2019. The next monthly meeting will be held at 7pm (note new start time) on Wednesday 27th March 2019 at The Royal Oak, Hurdlow, Near Buxton, SK17 9QJ www.peakpub.co.uk.